I used to teach English at Meadow Creek Christian School (now called Legacy Christian Academy) in Andover, Minnesota, and one thing I stressed to my students who were struggling with narrative-style writing is to start by simply writing what they know. Using our own lives as a backdrop for writing stories, whether fiction or nonfiction, is a fantastic way to help bring out our inner authors. Tolkien used his experiences in World War I as the backdrop for the conflicts in his Lord of the Rings tales. Michael Crichton imparted his extensive knowledge of science and medicine into his many books, movies, and television shows which he had a hand in creating. Even John Grisham, purveyor of many of the most popular legal thrillers today, began his career as an author only after practicing law for ten years and then used that as the basis for his creative works. What I’m getting at here is that sometimes it’s good to branch out into new and unexplored territories, but sometimes it’s nice to stick with what you know. There’s nothing wrong with treading in familiar waters—how often did you see Bob Ross do cubist-style paintings or try his hand at marble sculptures? 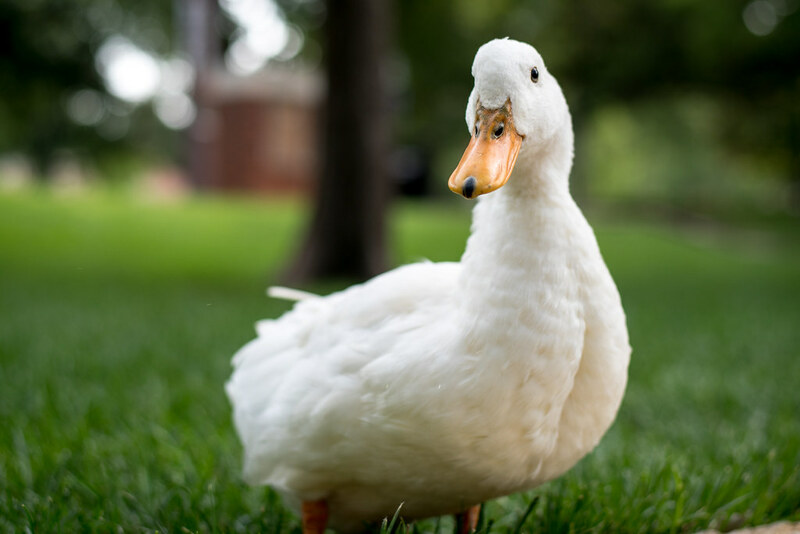 And that’s what’s happening in this picture of a relatively normal white duck. There’s a small pond on the OSU campus that is a favorite spot for me and many of our students and faculty, and even though it’s somewhat cliché to wander down there and take photos of the animals…well, who cares? I still like doing it. It’s not groundbreaking or earth-shattering, but pictures of the geese and ducks are fun and can often be challenging too, especially when shooting with a 50mm lens because the animals, despite their familiarity with humans, still like to keep a healthy distance. On this particular afternoon my friend Gina had brought some duck food along while we went on a short walk around the pond (apparently the stuff is super cheap! She bought 40 pounds of it from a local farm supply store for about $7) and it was fun to see the waterfowl overcome their trepidation and get very up close and personal with us while we fed them. I had my D750 with me so I used the opportunity to take some pictures, and you know what? I like this one and don’t even care that there are probably ten thousand others just like it. Taking this picture made me smile and it’s a fun little reminder of how there is nothing wrong with just doing what works. Handsome too!! Good to have duck food. I live near Lakeland Florida and we have a place called Mirror Lake that I take every opportunity to visit for the same reason. Love the ducks, herons, white pelicans – never get tired of those pictures, although I mostly use a 24-105 lens. Simon, I love this! You definitely captured the essence of our friends at the pond. The first word that came to mind when I saw this was “Sweet!” So happy you had this experience and shared it with us. I do the same thing at our pond. Ducks and turtles, just like everyone else. There may be other shots like this one, but you know what? I don’t think they have the same facial expression/emotion as your photo. I think it’s great!